Nifty seems to be undergoing a complex correction in the recent legs of 30 min chart.What is of practical interest to us, is what will Nifty do next. It has formed "a"wave of three legs. looking at chart , you are expecting c to go downwards below 7796 ( lowmade yday ), looking at fibo ratios i mentioned yday in comment section and move seen today while making intraday top of 7928 so far,we can see clear 5 sub waves of move from 7796 to 7928 and it has retraced by 76.4% also at today's low so far at 7826. so is it possible that c shown at 7832 actually ended at 7796 yday? I have replied by way of a post.Please see. 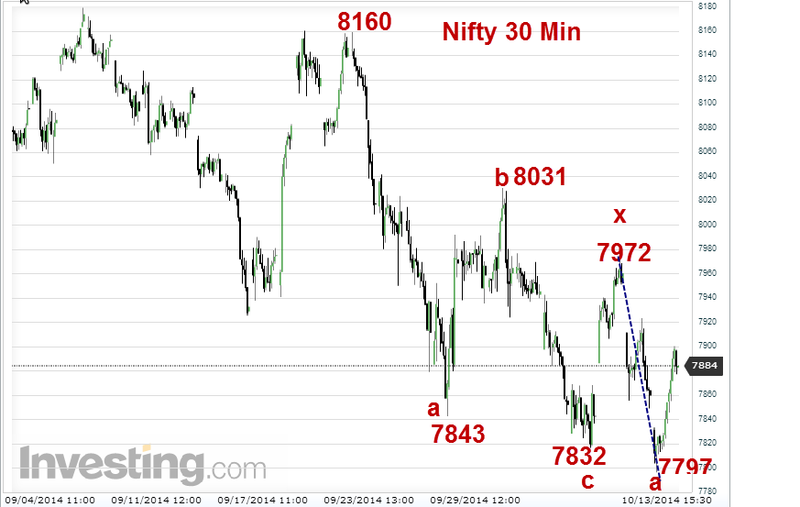 down ward movement from 8180 to 7724. i think it is ABC formation. if we compare US markets, they topped out when we made lower top at 8160 after 8180 top.US markets seems to be bottoming out.so i feel at least from here on wards we may move up rather than down. chart sent to u in google hang out.